This is another example of using the same arena set up for 2 back to back classes. Many instructors teach the same pattern class after class. But sometimes you want to use different patterns, such as to teach different skills. In this case my Student 1 has an hour lesson that overlaps two half hour lessons, and I didn’t want Student 1 to get bored doing the same pattern twice. 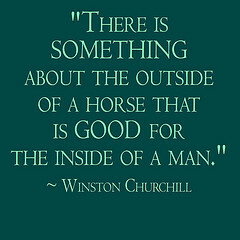 So for the first half hour I taught Student 1 and 2 the flag race to work on trotting, then had Student 1 stay on while I dismounted the Student 2 and mounted Student 3, and lastly taught Student 1 and 3 neck reining using the Egg and Spoon Class. 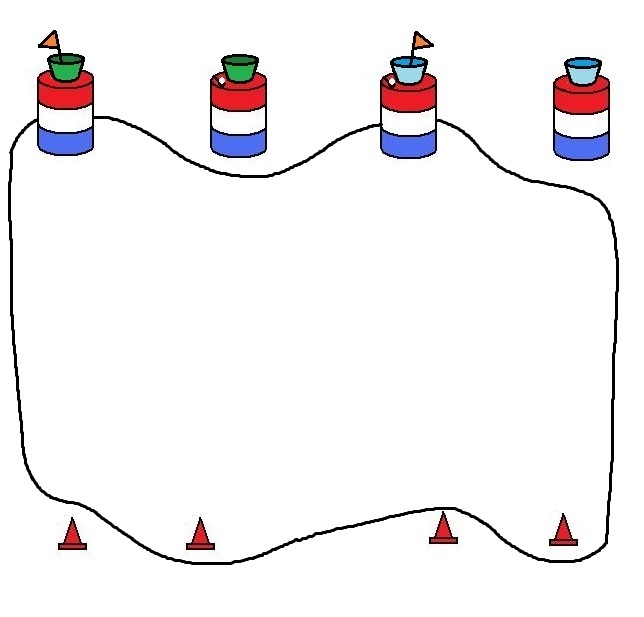 Note: the same arena setup below can be used for the flag race, the egg and spoon class, and weaving cones and barrels! Teach Skill or Remind of old skill we’re working on – such as woahing precisely by the barrel, or keeping their eyes up, etc., depending on their personal goals. 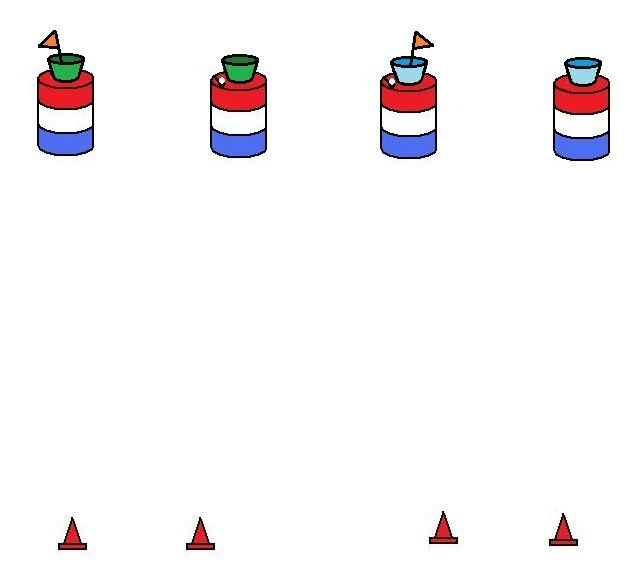 The Flag Race – Explain that in the flag race the rider starts between the cones, goes to the first barrel, stops, picks the flag out of the bucket, goes to the second barrel, stops, puts the flag in the bucket, and goes back to the start between the two cones. Show a picture, draw it on the ground, have a volunteer run it, etc. Point out that each student has their own 2 barrels, buckets, and flag (in my drawing one is green and one is blue), so they will be doing the pattern at the same time. Practice – Each student goes at the same time. Give praises and corrections as needed. 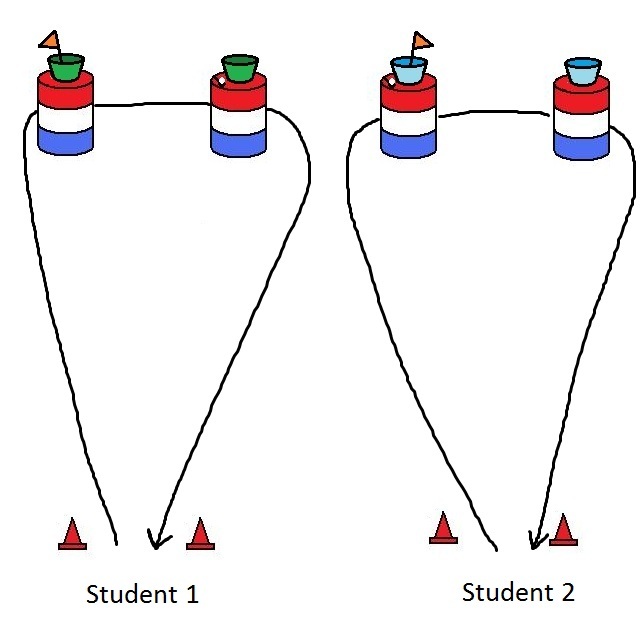 Progression – remove verbal prompts for pattern memory, take away leader/sidewalker assistance, take away the halt when dealing with the flag and bucket so the student must do it while walking by, add a trot on strait stretches then for the whole thing if the student is advanced enough, etc. The student will demonstrate woahing their horse directly next to a barrel with no leader assistance or verbal prompts 3/5 times. The studtent will demonstrate direct rein steering with a leader and no verbal prompts for 75% of the lesson. 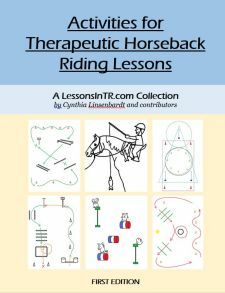 The student will ride a 4 step pattern without a leader and minimal verbal prompts 2x. Different regions do different types of flag races. For a few other versions see Squidoo’s Flag Race Page. One such version of the Flag Race is the “The Indiana Flag Race”. 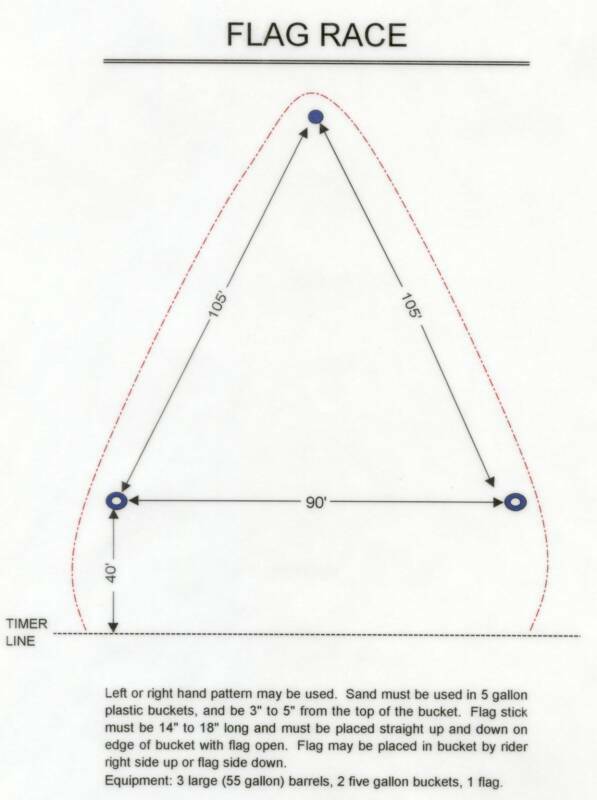 You can use this pattern instead of the one above, or add the third barrel during the progression part of your lesson (to progess to an extra pattern step or longer amount of trotting). The Egg & Spoon Class– as students walk on the rail, explain the egg and spoon class. Have the riders each stop by a barrel with an egg and spoon on it, and pick it up. First use the large spoons. Progression – woah by the barrels and trade their big spoon for a small spoon, add circling the barrels and cones, add trotting. Keep track of how many times each student drops an egg. The student will demonstrate neck rein steering for 90% of the lesson with minimal verbal prompts and with a leader and sidewalker. The student will sit quietly on their horse for 90% of the lesson with minimal verbal prompts and with a leader and sidewalker. Another good use of ideas……..thank you for the set up diagrams too, makes the explanation very clear and easy to follow. « Gymkhana Lesson 3: Cloverleaf Barrels…and a Circle Exercise!